For the city in Chile, see Diego de Almagro, Chile. For the island of Chile, see Diego de Almagro Island. Diego de Almagro (Spanish: [ˈdjeɣo ðe alˈmaɣɾo]; c. 1475 – July 8, 1538), also known as El Adelantado and El Viejo, was a Spanish conquistador known for his exploits in western South America. 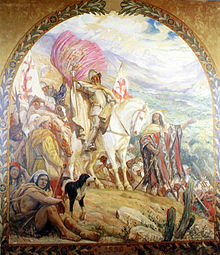 He participated with Francisco Pizarro in the Spanish conquest of Peru. From Peru Almagro led an expion that made him the second European to set foot in central Chile (after Gonzalo Calvo de Barrientos). Back in Peru a longstanding conflict with Pizarro over the control of the former Inca capital of Cuzco erupted into a civil war between the two bands of conquistadores. In the battle of Las Salinas in 1538 Almagro was defeated by the Pizarro brothers and months later he was executed. The origins of Diego de Almagro remain obscure. He was born in 1475 in the village of Almagro, 1 in Ciudad Real, where he took the surname for being the illegitimate son of Juan de Montenegro and Elvira Gutiérrez. In order to save the honor of the mother, her relatives took her infant and moved him to the nearby town of Bolaños de Calatrava, being raised in this town and in Aldea del Rey, run by Sancha López del Peral. When he turned 4 he returned to Almagro, being under the tutelage of an uncle named Hernán Gutiérrez until he was 15 years old, when due to his uncle's hardness he ran away from home. He went to the home of his mother, who was now living with her new husband, to tell her what had happened and that she was going to travel the world, asking for some bread to help her live in her misery. His mother, anguished, gave him a piece of bread and some coins and said: "Take, son, and do not give me more pressure, and go, and God help in your adventure." He went to Seville and after probably stealing to survive the boy becomes a "criado" or servant and raised by Don Luis de Polanco, one of the four mayors of the Catholic Kings and later his counselor, and who was mayor of that city. While performing his duties as a servant, Almagro stabbed another servant for certain differences, leaving him with injuries so serious that they motivated that a trial against him be promoted. Being wanted for justice, Don Luis de Polanco, making use of his influence, got Don Pedro Arias de Avila to allow him to embark in one of the ships that would go to the New World from the port of Sanlucar de Barrameda. The Casa de Contratacion demanded that the men who crossed the Indies carry their own weapons, clothes, and farming tools, which Don Polanco provided to his servant. Diego de Almagro arrived in the New World on June 30, 1514, under the expion that Ferdinand II of Aragon had sent under the guidance of Pedrarias Dávila. The expion had landed in the city of Santa María la Antigua del Darién, Panama, where many other future conquistadors had already arrived, among them Francisco Pizarro. There are not many details of Almagro's activities during this period, but it is known that he accompanied various sailors who departed from the city of Darien between 1514 and 1515. De Almagro eventually returned and settled in Darien, where he was granted an encomienda. He built a house and made a living from agriculture. De Almagro undertook his first conquest on November 1515, commanding 260 men as he founded Villa del Acla, named after the Indian place. Due to illness he had to leave behind this mission to the licenciate Gaspar de Espinosa. Espinosa decided to undertake a new expion, which departed in December 1515 with 200 men, including De Almagro and Francisco Pizarro, who for the first time was designated as a captain. During this expion, which lasted 14 months, De Almagro, Pizarro and Hernando de Luque became close friends. Also during this time De Almagro established a friendship with Vasco Núñez de Balboa, who was in charge of Acla. De Almagro wanted to have a ship built with the remaining materials of the Espinosa expion, to be finished on the coast of the "Great South Sea", as the Pacific Ocean was first called by the Spanish. Current historians do not believe that De Almagro was expected to participate in Balboa's expion and probably returned to Darien. De Almagro took part in the various expions that took place in the Gulf of Panama, taking part again in Espinosa's parties. Espinosa was supported by using Balboa's ships. De Almagro was recorded as a witness on the lists of natives whom Espinosa ordered to be carried. De Almagro remained as an early settler in the newly founded city of Panama. For four years he stayed there, working at the management of his properties and those of Pizarro. He took Ana Martínez, an indigenous woman, as a common-law wife. In this period, his first son, el "Mozo", was born to them. In an attempt to claim Quito ahead of Belalcázar, in August 1534 De Almagro founded a city on the shores of Laguna de Colta (Colta Lake) in the foothills of Chimborazo, some 55 kilometres (34 mi) south of present-day Quito, and named it "Santiago de Quito." 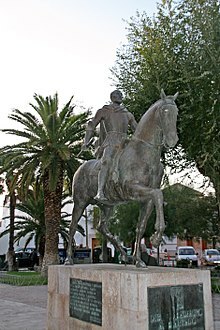 Four months later would come the foundation of the Peruvian city of Trujillo, which Almagro named as "Villa Trujillo de Nueva Castilla" (the Village of Trujillo in New Castille) in honor of Francisco Pizarro's birthplace, Trujillo in Extremadura, Spain. These events were the height of the Pizarro-Almagro friendship, which historians describe as one of the last events in which their friendship soon faded and entered a period of turmoil for the control of the Incan capital of Cuzco. After splitting the treasure of Inca emperor Atahualpa, both Pizarro and Almagro left towards Cuzco and took the city in 1533. However, De Almagro's friendship with Pizarro showed signs of deterioration in 1526 when Pizarro, in the name of the rest of the conquistadors, called forth the "Capitulacion de Toledo" law in which King Charles I of Spain had laid out his authorization for the conquest of Peru and the awards every conquistador would receive from it. Long before, however, each conquistador had promised to equally split the benefits. Pizarro managed to have a larger stake and awards for himself. Despite this, De Almagro still obtained an important fortune for his services, and the King awarded him in November 1532 the noble title of "Don" and he was assigned a personal coat of arms. Although by this time Diego de Almagro had already acquired sufficient wealth in the conquest of Peru and was living a luxurious life in Cuzco, the prospect of conquering the lands further south was very attractive to him. Given that the dispute with Pizarro over Cuzco had kept intensifying, Almagro spent a great deal of time and money equipping a company of 500 men for a new exploration south of Peru. By 1534 the Spanish crown had determined to split the region in two parallel lines, forming the governorship of "Nueva Castilla" (from the 1° to the 14° latitude, close to Pisco), and that of "Nueva Toledo" (from the 14° to the 25° latitude, in Taltal, Chile), assigning the first to Francisco Pizarro and the second to Diego de Almagro. The crown had previously assigned Almagro the governorship of Cuzco, and as such De Almagro was heading there when Charles V divided the territory between Nueva Castilla and Nuevo Toledo. This might have been the reason why Almagro did not immediately confront Pizarro for Cuzco, and promptly decided to embark on his new quest for the discovery of the riches of Chile. Charles V had given Diego a grant extending two hundred leagues south of Francisco Pizarro's. Francisco and Diego concluded a new contract on 12 June 1535, in which they agreed to share future discoveries equally. Diego raised an expion for Chile, expecting it "would lead to even greater riches than they had found in Peru. ":230,233–234 Almagro prepared the way by sending ahead three of his Spanish soldiers, the religious chief of the Inca empire, Willaq Umu, and Paullo Topa, brother of Manco Inca Yupanqui. De Almagro sent Juan de Saavedra forward with one hundred and fifty men, and soon followed them with additional forces. :230,233–234 Saavedra established on January 23, 1535 the first Spanish settlement in Bolivia near the Inca regional capital of Paria. Almagro left Cuzco on July 3, 1535 with his supporters and stopped at Moina until the 20th of that month. Meanwhile, Francisco Pizarro's brother, Juan Pizarro, had arrested Inca Manco Inca Yupanqui, further complicating De Almagro's plans as it heavily increased the dissatisfaction of the Indians submitted to Spanish rule. Not having formally been appointed governor of any territories in the Capitulation of Toledo in 1528, however, forcing him to declare himself adelantado (governor) of Nueva Toledo, or southern Peru and present-day Chile. Some sources suggest Almagro received such a requirement in 1534 by the Spanish king and was officially declared governor of New Toledo. Once he left Moina, De Almagro followed the Inca trail followed by 750 Spaniards deciding to join him in quest for the gold lost in the ransom of Atahualpa, which had mainly benefited the Pizarro brothers and their supporters. After crossing the Bolivian mountain range and traveling past Lake Titicaca, Almagro arrived on the shores of the Desaguadero River and finally set up camp in Tupiza. From there, the expion stopped at Chicoana and then turned to the southeast to cross the Andes mountains. By luck, these men found the Valley of Copiapó, where Gonzalo Calvo Barrientos, a Spanish soldier whom Pizarro had expelled from Peru for stealing objects the Inca had offered for his ransom, had already established a friendship with the local natives. There, in the valley of the river Copiapó, Almagro took official possession of Chile and claimed it in the name of King Charles V.
De Almagro promptly initiated the exploration of the new territory, starting up the valley the Aconcagua River, where he was well received by the natives. However, the intrigues of his interpreter, Felipillo, who had previously helped Pizarro in dealing with Atahualpa, almost thwarted De Almagro's efforts. Felipillo had secretly urged the local natives to attack the Spanish, but they desisted, not understanding the dangers that they posed. De Almagro directed Gómez de Alvarado along with 100 horsemen and 100 foot to continue the exploration, which ended in the confluence of the Ñuble and Itata rivers. The Battle of Reinohuelén between the Spanish and hostile Mapuche Indians forced the explorers to return to the north. De Almagro's own reconnaissance of the land and the bad news of Gómez de Alvarado's encounter with the fierce Mapuche, along with the bitter cold winter that settled ferociously upon them, only served to confirm that everything had failed. He never found gold or the cities which Incan scouts had told him lay ahead, only communities of the indigenous population who lived from subsistence agriculture. Local tribes put up fierce resistance to the Spanish forces. The exploration of the territories of Nueva Toledo, which lasted 2 years, was marked by a complete failure for De Almagro. Despite this, at first he thought staying and founding a city would serve well for his honor. The initial optimism that led Almagro to bring his son he had with the indigenous Panamanian Ana Martínez to Chile had faded. The withdrawal of the Spanish from valleys of Chile was violent: Almagro authorized his soldiers to ransack the natives' properties, leaving their soil desolate. In addition, the Spanish soldiers took natives captive to serve as slaves. The locals were captured, tied together, and forced to carry the heavy loads belonging to the conquistadors. After the exhausting crossing of the Atacama Desert, mainly due to the weather conditions, Almagro finally reached Cuzco, Peru, in 1537.:254 According to some authors, it was during this time that the Spanish term "roto" (torn), used by Peruvians to refer to Chileans, was first coined. De Almagro's disappointed troops returned to Cuzco with their "torn clothes" due to the extensive and laborious passage on foot by the Atacama Desert. 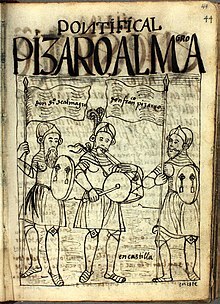 During this time Almagro fell ill, and Pizarro and his brothers grabbed the opportunity to defeat him and his followers. The Almagristas were defeated at Las Salinas in April 1538, with Orgóñez being killed on the field of battle. De Almagro fled to Cuzco, still in the hands of his loyal supporters, but found only temporary refuge; the forces of the Pizarro brothers entered the city without resistance. Once captured, Almagro was humiliated by Hernando Pizarro and his requests to appeal to the King were ignored. "-he was surprised to see Almagro demean himself in a manner so unbecoming a brave cavalier, that his fate was no worse than had befallen many a soldier before him; and that, since God had given him the grace to be a Christian, he should employ his remaining moments in making up his account with Heaven!" Diego de Almagro II (1520–1542), known as El Mozo (The Lad), son of Diego de Almagro I, whose mother was an Indian girl of Panama, became the foil of the conspirators who had put Pizarro to the sword. 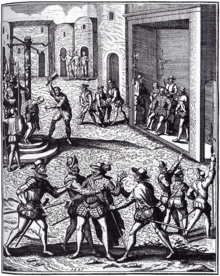 Pizarro was murdered on June 26, 1541; the conspirators promptly proclaimed the lad De Almagro Governor of Peru. From various causes, all of the conspirators either died or were killed except for one, who was executed after the lad Almagro gave an order. The lad De Almagro fought the desperate battle of Chupas on September 16, 1542, escaped to Cuzco, but was arrested, immediately condemned to death, and executed in the great square of the city. ^ (in German) García, Celso; 1973. Die Eroberung von Peru: Pizarro und andere Conquistadoren, 1526-1712. Erdmann: Horst Erdmann Verlag. ^ Hemming, J.. 1970. The Conquest of the Incas. Harcourt Brace Jovanovich, Inc., New York. ^ a b c d e f g h i j k l m n Prescott, W.H.. 2011. 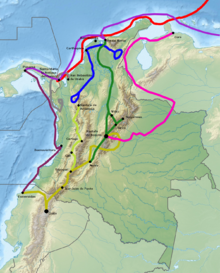 The History of the Conquest of Peru. Digireads.com Publishing. ^ Leon, P.. 1998. The Discovery and Conquest of Peru, Chronicles of the New World Encounter. Duke University Press. (in Spanish) Amunátegui, Miguel Luis. 1862. Discovery and conquest of Chile - Study of Diego de Almagro, 37-179. Accessed 2005-02-13. (in Spanish) Ballesteros Gaibrois, Manuel. 1977. Diego de Almagro. (in Spanish) Dermit, Pedro. 1998. La expedición de Diego de Almagro. DMS 6. 55–79. Keller, Carlos. s.a. Michimalonco, Pedro de Valdivia and the birth of Chile. Accessed 2005-02-14. Keller, Carlos. s.a. The consolidation of the Spanish dominion in Chile. Accessed 2005-02-14. (in Spanish) Larraín Valdés, Gerardo. 2001. Diego de Almagro, _. Editorial Luxemburgo. MacQuarrie, Kim. 2007. The Last Days of the Incas. Simon & Schuster. (in Spanish) Pizarro, Fernando. s.a.. Vida del mariscal y adelantado Don Diego de Almagro el viejo y de su hijo Don Diego de Almagro. Accessed 2005-02-13. (in Spanish) Pucci, Lucas. 1998. Vida y obra de Diego de Almagro. Accessed 2005-02-13. Wikimedia Commons has media related to Diego de Almagro.